Monday, October 2, 2017 3:30 PM William Tennent High School AWAY 2 Central Bucks West High School HOME 0 Game Recap Brandon Hefele had a shut out in goal for the Panthers in the win. Billy Hanratty and Sean Metz contributed offensively, scoring the goals in the competitive match-up. Saturday, September 9, 2017 11:30 AM Archbishop Wood High School AWAY 1 William Tennent High School HOME 6 Game Recap JV soccer had a strong showing vs Archbishop Wood on Saturday. 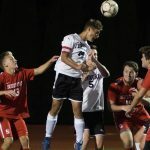 Goals for William Tennent were scored by: Rivaldo Ortiz, Dan Higgins, Kevin Pollick (2), Connor Berndlmaier, and Evlad Fonda.